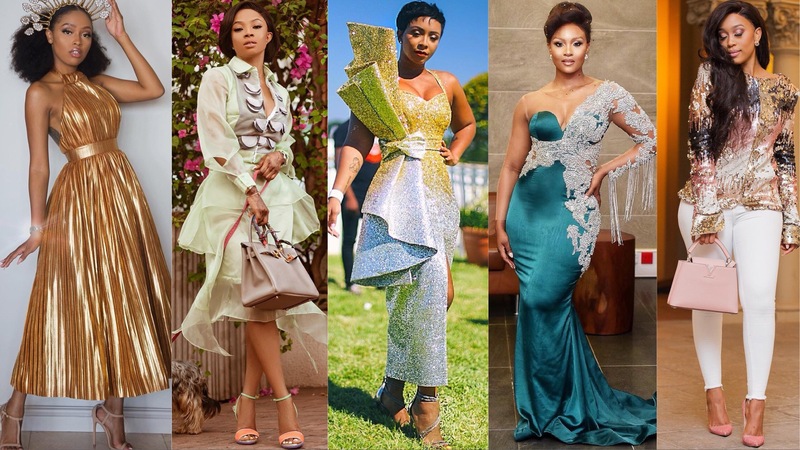 The past week was quite a stylish one, especially for celebrities and influencers in Nigeria and South Africa. These two countries overtook the continent with rave-worthy styles that left us totally awe-struck. Over in Lagos, Nigeria the first ever Film Gala held just as the Sun Met – a South African race event also took place in Cape Town on January 26; both events happening miles and hours apart. Each event came with a theme. For the Film Gala: “Married to the Arts” and for the race course event: “African Luxury: Precious Metals.” These themes gave life to each event as celebrities made sure to impressively match the theme in luxurious outfits. Not all the looks on this list belong to these two functions but they sure make up for 80% of the collection. In a bid to usher in Spring early, OAP Toke Makinwa served pastel delight with this look. The combination is elegant and fun and we love. Osas Ajibade is always a “Belle at the Ball” and she totally killed it in this Tope FNR number as the host of the Film Gala. It’s always interesting to see an alternative look that reminds you of the goddesses you are shown on TV. Toni Tones sure did justice to this look like a true style star. We can’t deny how flawless TV presenter Seyitan Atigarin looks. Jane Micheal Ekanem is a fashion killer so we only expect the same from anyone rocking her design. If we weigh and measure all the looks we’ve seen this year, Kamo Modisakeng’s golden-hued outfit would still stand tall. We’d probably use a different shoe but overall this look is golden! Blue Mbombo embraced every element of this look – from the sheer lace fabric to the detailing to the chiffon train. The hairstyle just adds the icing on the cake. Boity Thulo comes correct every time. The South African media girl knows the right look for every occasion and this right here was festive and fantastic. It fits into the Sun Met theme perfectly. Buhle Samuels looks so chic in this look. We love how the curvy actress rocked her white pants with this gorgeous sequin top. She channelled new year’s glam with a soft chic finish. Linda Mtoba looks like an Amazon disguised in zebra stripes. There’s something almost regal about her look and although her shoe is yet another choice we would swap, we’ve got a real appreciation for her uniqueness.